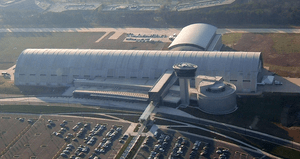 Many of us who love to visit the Smithsonian’s Udvar-Hazy Air and Space annex in Chantilly often complain about the high $15 parking fee required of visitors (who have no choice but to park at the site. Now, it appears that more than $1.5 million was skimmed off by the booth personnel working for PMI Corporation. Freweyni Mebrahtu, 46, was sentenced to two years and three months in prison for her part in the conspiracy last week. Notably, Mebrahtu insisted that she never stole during the Muslim holy days of Ramadan. It appears that she considered that to be proof of being a moral person. In her sentencing hearing, Mebrahtu admitted to stealing over $895,000 over three years, but said that she did so at the urging of her supervisors with parking contractor PMI. She said that her supervisors demanded two-thirds of the money Mebrahtu took in. A second employee, Meseret Terefe was sentenced to 20 months in prison after for stealing $487,000 in parking fees and a third employee died awaiting trial. The third employee is believed to have stolen $120,000 during her tenure. The employees would unplug the machines that counted the vehicles to skim the fees for almost 40 percent of the cars coming to the museum. That is an amazing degree of fraud and it is hard to believe that supervisors at PMI were not aware of the discrepancy. The best case for PMI is to insist that it is grossly incompetent and negligent. The company has refused to respond to media inquiries, apparently believing that it has not obligation to answer any questions from the public as a government contractor. What is astonishing is that PMI continues to run the parking at the museum. Indeed, Smithsonian has said that it has not decided whether to award PMI another contract when its current contract expires in April. It appears that missing the revenue for 40 percent of the cars is not viewed as, in itself, grounds for non-renewal — let alone early termination — in a government contract. There are many things the government should, and does, contract for. For example, why should the government build firearm factories, when they can buy military and law enforcement weapons from Glock, H&K or Smith & Wesson? And how about airplanes? No need to build clothing factories when they can buy uniforms to specification for everything from law enforcement to military. On the other hand, government should never contract out law enforcement and corrections to private companies. And to send mercenaries to war zones for many times the pay of an enlisted man or woman beggars the imagination. It used to be the government did all of those things and cheaper. Ever hear of the Springfield armory? The Navy built its own airplanes too as well as lots of other items. Unfortunately, Congress figured out that contractors pay a lot more to Congressmen than government workers. Thus the dumping of all governmental fundctions so that we can pay more for government services so that the wealthy can make more money off of us. Sounds fair, right? If the job at hand is occasional such as fixing a piece of equipment that rarely breaks and there are insufficient need to have full time staff, private contracting is better. When services are needed that are temporary or seasonal, such as snowplowing parking lots private is better. When talent is needed for a specific task, such as providing an interpreter in a foreign language rarely spoken in the US. When there is an immediate need for a particular talent and there is no resource available already on staff and it can be found in private industry then yes. If not the above, then in general the gov’t is better doing things itself. Actually when the costs are too great, it is the government which has to shoulder the burden since it is not economical for any private business to do the job. I myself working in the parking department at a museum. It is amazing that any company could have engaged in this level of fraud. The Smithsonian does not need a private company to do their parking. Why they are in consideration of another contract, I have no idea. Don’t want to embarass anybody. But you guys are good today. Especially G and M and even B. A shame only that we deal with private skimming instead of skimming our civil liberties in LA and surrounding cities at the Dorner blog. PS Thanks whoever it was who kicked the Prof in the shins about his use of religion. Even though I get angry at the fraudulent use of UNHCR and Sweden’s quota take of them. One husband goes and says he is persecuted because of political, bla bla. His relatives support wife, kids which he says he does not have. He gets to Sweden, and then can bring all umpteen members of the family afterwards to Sweden, under our policies. They got homes, education, guaranteed income for not working, and mosques awaiting them. Met two of the offspring yesterday at the local grocery store. One from Pakistan, and one from Iraq. My name is PM of Israel. Now I might even swing on the religious aspect too. Is it the strain of saying Inshallah that is getting to me? Mr Ed and other lovers of technical solutions. Why look for audits. Just have “our” computers look over the daily overflight pictures taken by our spy satellites. Surely this spot is covered. Personal reference: In or around 1964 I did a material flow study for new glass plant near LA, which had previously and would continue to produce “blanks” of monster size for spy satellite lens grinders. Cooling rate: about 1 degree F per hours (max). One recovered satellite of an early generation is at the Smithsonian. Not sure where. Chantilly? Where is that? In darkest VA? What Darren said. Pay back the stolen revenue and say good by to your contract. The parking cost is another irritant to me. It is often just another source of revenue where admission tickets are supposed to be free. (for better or worse) Over here the state and to some extent the federal parks tried to have admission costs and there was a backlash by the public. So, the gov’t charged parking fees to visit certain outdoor parks. PMI has a fiduciary responsibility in this matter. The gov’t should make them pay back the money, after they fire them. The next step would be to force an audit on any other contracts PMI has with the gov’t to see if this is widespread. Brown said changes were implemented after last year’s arrests to make it impossible for thefts to occur in the same manner. I’d be interested in knowing how many enterprises, private or public, PMI has done that to. With that kickback scheme, I’m betting if you scratched just a little bit on the surface, you might find organized crime underneath the PMI veneer. Parking, like some other businesses such as restaurants, limo companies, etc., lends itself to organized crime because it’s a largely cash money business. Easy to skim or launder money through. I am a big believer in Karma. Lessee now, somebody may scam the owners personally. Perhaps a Nigerian widow will access his personal bank account. And also whoever at the GAO who thought this was a good idea. I would be interested to know how many private enterprises PMI has done that to.